After a quick two month break we are back on the trails again. In these short 2 or 3 mile runs on the dirt roads we will be training the Deadwood pups (a whole litter named after the HBO series: Alma, Jewel, Ellsworth, Wu, Swidgeon, Joanie and Sophia) to run in lead. It was the first run with my son, Tyler up in Alaska and I appreciate the extra hand. 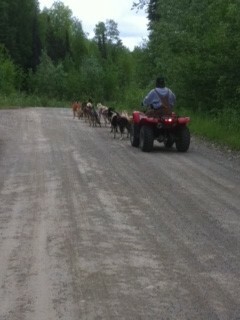 He has a lot to learn the summer to become a musher. Run went well. Tried Swidegon in lead for a bit and he wanted to pull over towards the water puddles and a man walking his dog. Work to do! 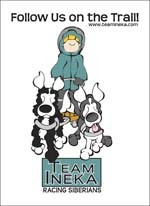 Follow us on the trail at http://www.teamineka.com ! Interesting photos and video. I have always wondered about how mushers prepare their pups for the Iditarod. Thank you for your comment. 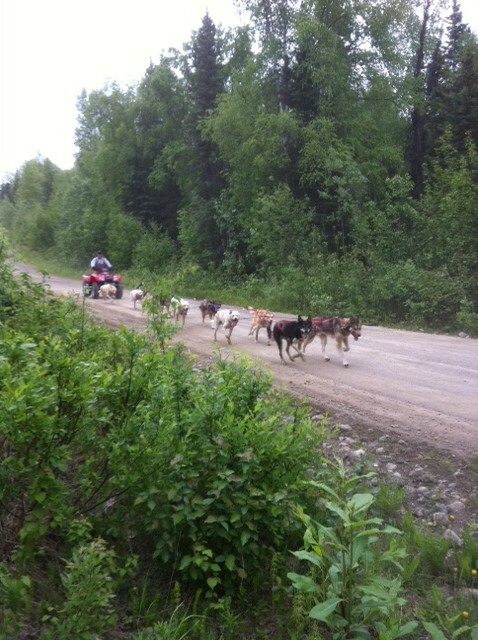 Yes many mushers train all year. Leader training is probably the most important thing. Thank you for your comment. Yes, we train in the summer if it is cool enough. In the mornings it is still in the 40s. Check this out guys…..new fan page by Lethal Len Productions. Need a website, graphics, etc.? This is where you need to go. Alaska is on my To-Do list, and I must give Mushing a try, it looks like so much fun! Congrats on Freshly Pressed. It is great fun! I have been dreaming on the Iditarod for 20 years. I made the jump to move up here last August. Thanks for the comment. Thanks for these photos and video. i’m not a fan of cold, but for some reason mushing always appealed to me. seems fun and adventurous. would love to try it sometime! Great post! I visited Alaska during the summer a few years ago and loved. Looking forward to returning during the Iditarod. Big congratulations on being Freshly Pressed! Thank you for reading and taking time to comment. Look me up when you are up in Alaska for the Iditarod. Try it with 50 howling huskies! It’s a lifestyle that is highly addicting. Thank you for reading and your comment. thank you for reading and your comment! Thank you for your comment! Once you try it you will be hooked! Thank you so much for reading and the comment! I used to take my dog team to the little mom and pop grocery store in Minnesota when I lived there. Too much snow to justify driving. Great information…loved the video. Looks like your training paid off. We love traveling to Alaska, our daughter lived for several years. We rented a motor home and toured at our leisure. Great pix too. Thanks for taking the time to comment, read and watch my little video. Alaska is a great place. I have been here less than a year so I havent seen a lot of it yet. Nice dogs, I’ve been an owner myself but never knew how to train it to the basics like peeing at the right place. Do you have any tip for me? In regards to training the dogs to relieve themselves on command while running in a team, I havent seen that happen. Usually we break every couple hours for a snack and a “good dog” and they do it then. What a great post! I am going to follow your training it is really exciting. Thank you! I’ll post throughout the year. Lots of exciting things coming up with this young team! great post. Amazing dogs.I wonder how you trained them. Thank you! Regarding training: we were on the trails for well over 2500 miles last winter. That looks so beautiful! Absolutely fantastic blog! I love dogs! Thank you for reading and your comment. It is a life that I wouldn’t give up for the world! Great post! What an exciting and unique life you share. Looking forward to following your journey and interests. Thank you. I post often about my adventures on the trails in Alaska. Keep in touch. Very interesting; what a great post!